When Do You Know You're Done Having Babies? 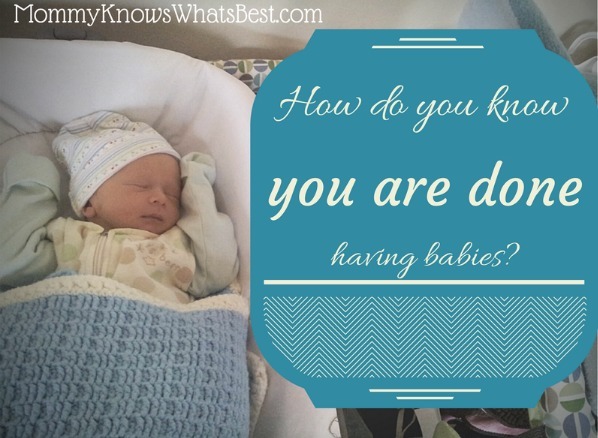 When Do You Know You’re Done Having Babies? My gut reaction is to look at them in disbelief or to grunt because it’s the same person asking for the millionth time. Do they not see the whirlwind of kids running around me? Do they not see the crazed look in my eye when I have repeated myself for the umpteenth time about not fighting with each other or throwing food on the ground? Do they not know that my daughter, my 3.5 year old, STILL wakes up at least once every night, interrupting my precious sleep patterns? Yeah, they know. They also know we totally and absolutely love our three kiddos, so they ask anyway. I guess they can’t help it. I mean, we had three, so why not one more? It seems so easy, doesn’t it? Then there’s the slight problem of where in the world will we fit another kid?? We’re pretty certain that we know we’re done having kids. Three is a great number for us, and we’re a happy family. Before we had our third baby, I thought two was going to be the magic number since I was having trouble getting pregnant, but we were blessed with our third baby after nearly 18 months of trying. Three. Three is a good number. 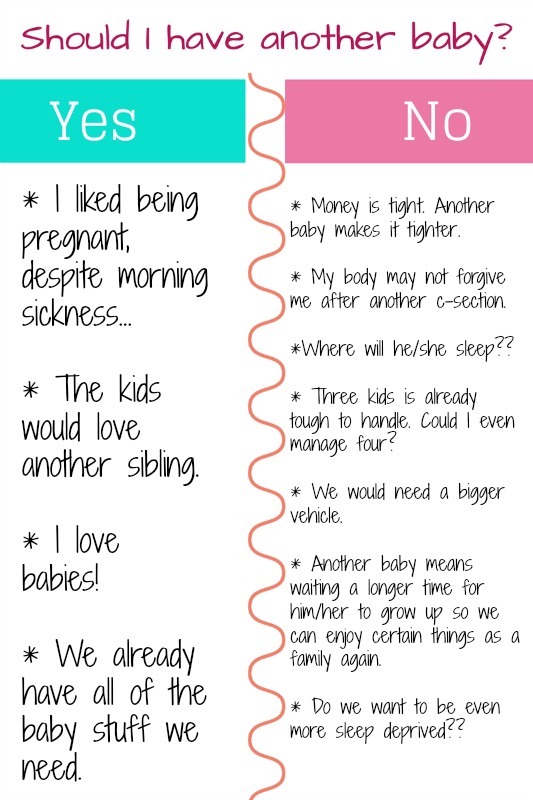 Honestly, to really figure this all out, you know, if we’re done having babies, I came up with a pros and cons list of sorts. Sometimes, you just have to write stuff down to get it all out of your head! I totally admit that some of these items are selfish. Why shouldn’t they be? Having a another baby is a HUGE decision, one that involves, well, myself. I also know that some of these things can be fixed or managed. Since we already have all of the major baby stuff we need (crib, clothes, toys, swing, sling, wrap, high chair, pack n’ play, etc) we wouldn’t need to spend much money, but there’s still the issue of diapers and, should I need to use it, formula. We could also manage to find a bigger vehicle, but that may be a bigger car payment than what we can handle right now. We also love our kids, and another child would be just as loved. But the rest always makes me think. Could I handle four kids? There are many people who say that after three to four kids, it just gets easier. Does that just mean birthing the child and then having him or her around as a baby? I picture four Tasmanian devils running around my house. Ever see those critters? Yikes. Can my body handle another pregnancy and birth? I am strong, if I do say so myself, but I don’t know if my body can handle another pregnancy and another major surgery. Like I said above, I’m not a candidate for VBAC, so it would have to be another c-section, and another long recovery. And then there’s the matter of my weight loss, which I didn’t add to the list (yep, being selfish again!). Since March 2103, I have lost almost 50 lbs, which brings me back to a post-baby post-pregnancy weight that I haven’t seen in 8 years. Do I want to gain some of that back, putting me once again at risk for gestational diabetes or heart disease, both of which run in the family? It’s a lot to consider. Do you ever really know if you’re done having kids? I mean, does the universe throw you some giant signal telling you enough is enough? Does your body just stop making babies naturally, when it’s time to stop? For some people, I guess they just know they are done having babies. Some people are perfectly content with one child. Others like having two or three (which is fairly average now, wouldn’t you say?). Some say they’ll have four and be done. So Are You Done Having Babies? I think it’s definitely something to take time to think about, especially if you have some of the pros/cons that I have in my list above. You might need to do some math, check your surroundings, make lists of your supplies, and talk to other parents who have been there before. There’s no magic secret to knowing if you’re done having babies. Only you and your partner can decide if it’s the right decision for you. Make your own pros and cons list and have an honest discussion. It wouldn’t hurt to discuss these things with your doctor as well. Here’s a FREE PRINTABLE to help you get started! I guess it could be invasive, but it was a general question to help the thought process along, you know? I guess each family has to make this decision based upon the health, desires and financial status of the members of that family. You certainly do not want to risk your health. You need to be strong to take care of your present family. You know our family planning was not exactly planned. After our third we were told there would be significant risk in having a fourth. After our fourth child people judged us….We were selfish, we were irresponsible, we just wanted a girl!!! All our children are a blessing and our lives are complete because of them. Do what is best for your family and especially your health. Your children need a healthy mommy.